Trust a Drood to find a measure of revenge in justice and duty. 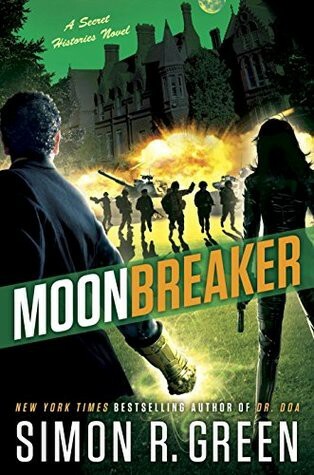 “Moonbreaker” is the eleventh book in “Secret Histories” series, by Simon R. Green. It continues the story of Eddie Drood who was poisoned in his last outing. Eddie and Molly are searching for Edmund Drood when this story begins. The Secret Histories books have been a guilty pleasure for me. The characters are one dimensional, the writing repeats itself, the plot is ludicrous. But, somehow, all these elements come together in way that is hard for me to put down the book. This could be due to the frenetic pace or it could be due to the books not taking themselves seriously. By now, the Secret Histories books have merged into one congealed mass in my mind. Not that it has any impact on enjoying “Moonbreaker”. “Moonbreaker” has all the ingredients that make a ‘Secret Histories’ book. There are situations where the Drood armour is needed. Eddie Drood alone can save everyone. Molly talks a lot. Fantastic creatures and worlds abound. There is a cliff hanger. Eddie Drood wins. Fans will love this book. Readers unfamiliar with this character can start on any book in the series. “Moonbreaker” is as good as the rest. This is a decent read — I recommend it to all readers of fantasy, but not too loudly.